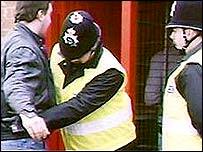 From October disability discrimination laws cover the police. How are forces changing to ensure they get the best from all their officers, whatever their physical ability? 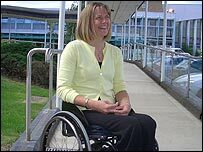 When Detective Sergeant Paula Craig was knocked off her bike by a car in May 2001, and was told she would need to use a wheelchair, there was never any thought among her bosses that she would not come back to work. While some may assume a police officer's career may have ended in the accident, nothing was further from the truth. Today, the detective is assigned to the Metropolitan Police's Serious Crime Group, targeting some of the most dangerous individuals in society. She has nothing but praise for her "absolutely brilliant" colleagues and managers. "When I was in hospital, the Commissioner, Sir John Stevens, came to see me and he was absolutely wonderful," says DS Craig. "We discussed what roles I would still be able to do. There was never any question of me not coming back." People outside her immediate circle often assume that she used to be in the police force, she says. "And when I say 'I still am', they're shocked." 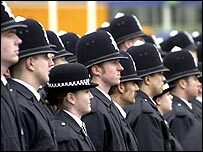 From October 1, the uniformed services - police, fire and prison service - lose their exemption from disability discrimination laws. According to the Disability Rights Commission, the national watchdog overseeing the changes, this means forces must ensure they do not discriminate against people where it can be proved they can do the job - people like DS Craig. This in turn means a culture change has started as to the importance of physical fitness away from frontline duties. "They've all reviewed their policies, but the challenge now is to make sure that this work is put into practice," the DRC's Agnes Fletcher told BBC News Online. "The legislation is quite clear - people still have to meet the requirements of the job, so we're not talking about hiring wheelchair users to chase bank robbers." Linda van den Henda, the Metropolitan Police's spokesman on disability issues, says the force has been leading the way in preparations. "Our fitness test has been redesigned, but you still have to be able to handcuff people, use a baton and restrain somebody who's trying to escape," she said. The force has reconsidered how to deploy officers who develop a long-term condition during their service. These "restricted duty officers" are assigned to jobs away from the frontline, says Ms van den Hende. "There are many roles in the police force, detective work for example, that can be carried out at a desk using a computer," said Ms van den Hende. "People use their policing knowledge, skills and experience in ways that don't demand high levels of fitness." In DS Craig's case, she has shown that her physical disability does not affect her police work - and is now studying for promotion to inspector. She says her managers recognised she had a right to a career - and have worked to use her experience to their mutual gain. If anything, she says, her colleagues can be too ambitious for her. "Sometimes they ask me to come out on surveillance jobs, and it's me that has to say that I can't because things like finding a disabled toilet nearby are just not practical." "I've been lucky because I've had 15 years as an able-bodied officer and I'll serve another 15 as a disabled officer. People like me show that it can be done." But DS Craig's positive experience is not universal, according to Alan Robinson, chairman of the Met's disabled staff association. Pc Robinson, a constable based at the West End Central station, has a heart condition that is brought on by excess body heat. When he was asked to wear a bullet-proof vest in a crack house raid, he had to declare the condition. It was the end of his frontline career, he says. The nearest he now gets to what he describes as "real police work" is calling victims of crime. "Some managers only want fully fit people," he said. "Not enough provision is made to keep officers." Pc Robinson thinks many officers hide disabilities out of fear of being assigned to less important "back office" duties. He says that the culture of middle management - chief inspectors and so on - needs to change in order to give disabled people access to proper opportunities. But Linda van den Hende says that ultimately public safety is the key factor driving decisions. "We're developing a national package of disability awareness training which should be available to all forces by October," she said. "There's always going to be a difficulty about the safety of the public and the rights of the individual. At the end of the day we have to make a judgement."